Update: Looks like the seller didn’t like selling you last year’s Nexus 6, a perfectly good phone even for late 2015, at that ridiculously low price. The listing has been pulled. I know that you are all awaiting the shipment notification for your Nexus 6P orders, or maybe our review of it, or maybe to see if it’s good a few months down the road, but if you need an excellent phone to temporarily pass the time, check out this deal on the Nexus 6 over at eBay. 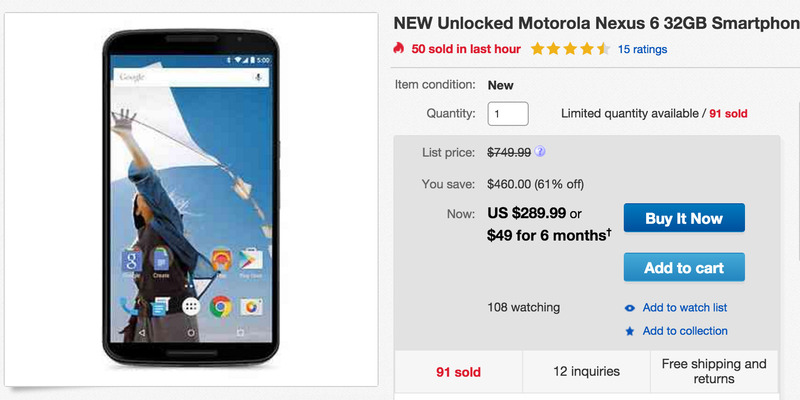 For $289, you can have a brand new, unlocked Nexus 6 with 32GB of storage. That’s nuts! Remember, this phone originally retailed for $649 when launched. It’s now well under half the price that Google and the silly carrier partners it joined with last year thought it was worth. And look, this phone isn’t as good as the 6P. But after spending some time with it on official Android 6.0 Marshmallow over the past few days, I’m starting to think that it may be better than the newly announced Nexus 5X. This is still a solid option, especially at that price.